Impressions: Heard good things about this one, lots of people consider it the best post-Beatles solo album any of them ever made. Let’s put it on: Beautiful hazy opener, with George’s (first names only, please) wonderful guitar lines weaving their magic. “Oh My Lord” is fantastic, builds so beautifully. Nice strings, great lead guitar, heavenly chanting… a very pleasing listen. There’s something gentle about George’s approach that’s very appealing without being mushy. He never seems like a wuss, especially when he cranks up the guitar in songs like in the longish jam “Wah Wah” or the even longer “Isn’t It A Pity.” He also never seems like he’s in a hurry and is perfectly happy to let longs wind their own way instead of relying on the the 2-3 minute pop song formula. “What is Love” is a stomping triumph, featuring a great descending riff. It’s an simple love song that is shot into the stratosphere by a lush arrangement with horns and strings (not to mention the benefit of adept usage in the movie Goodfellas.) The haunting “Beware of Darkness” floats in much like his best Beatles song “Something” does and lots of other songs have a similar dreamy quality. 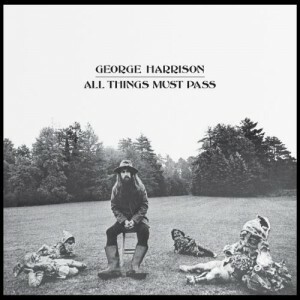 This album should have end with the perfect “All Things Must Pass!” Some good songs afterward but too many long, inessental jam sessions like “Wah Wah.” What was he thinking? It’s as if George thought he might only get one crack at a solo album and wanted to get all the music out of his system. Should this be on the list: Yes. Will you listen to this again? I hope so… I had to actually buy this one! Summary: Serene guitar hero spins out an excellent, agreeable triple album of post-Beatle pop that is easy on the ears, and maybe has a few too many jams, but no biggie.